Hey guys! I know it has been forever since I’ve updated my blog, but the other day something happened and I felt like it was very appropriate to tell you about it! Thursday, I undertook the task of “biting the bullet” (at least that’s how I felt) and asked for assistance from my university. I live by myself and I wanted to ask for assistance in getting an alert system for my apartment. I never like to ask for help and I get easily embarrassed when I do. I hate feeling like I’m needy or helpless and that I am left to another human being to fix my own problems. I know, I am your typical male in wanting to fix my own issues even when it may be beneficial to ask for help. Getting back to the story, I went to the office of disability services in order to look into possibly getting an alert system for my apartment. I have never registered with the office of disability services, and they never even knew I was on campus. When I called it obviously did not please them that I hadn’t registered. I had always hated the idea of the label “disabled” pinned on my file, or even on my life. I know, asking for help doesn’t make me disabled, but I’ve always been a very independent person and I’ve never wanted to think of myself as a somewhat lower class citizen, so I haven’t registered. Even through high school, it was somewhat difficult for me to accept that I was a little bit different than everybody else. Thursday though, it was the idea of actually registering with the “Office of DISABILITY Services” that completely freaked me out. To the general public, the word disabled carries a negative stigma with it that I don’t want associated with me. Apparently the alert system will cost about $3000, and I will have to move into another apartment in order to receive it’s benefits after I’ve registered. They told me that I need to consider a signer or a professional note taker because all of the other deaf people use it. Honestly that frustrates me. Yes, I understand that they are trying to help. 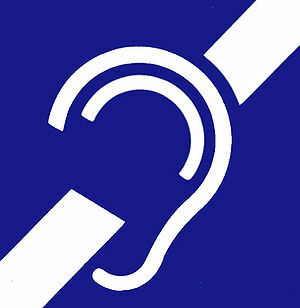 But not every deaf person fits their cookie cutter definition of “deaf”. That’s what I’m trying to prove to people by going to school, holding a job (several actually! ), and being a mainstreamed student. I feel like people needs to expand their belief system a little and understand that not every person is the same. The lady went on to say that I was “hard of hearing”, not “deaf”. Okay? I was a little frustrated to be labeled by somebody who has no grounds to speak on the subject. I really have a problem with people passing judgements on another person without any prior knowledge. This applies anywhere in life, not just with deaf people. The other day when I actually wrote this post, it was fuming with anger. I deliberately waited to post it so that I would not post something inappropriate. I was irritated with the fact that a person who didn’t know me took one look at my life and labeled me as deaf who needs a signer amongst all kinds of other services. I was mad that she looked at the outside of me and labeled me instead of looking at the actual me and finding out who I really am. I’m afraid that that happens too much in life, I catch myself passing judgements all kinds of people even when I don’t know them. This experience has opened me up to trying to actually get to know different people in life. It has also opened me up to the ignorance of people in society sometimes, but hopefully being patient will help them in the long run.